The second the value of your home crosses under the amount you owe in mortgage debt there is no reason to continue making payments. You will be provided the opportunity to possibly live payment free for years. The argument against a strategic default up until now was that it would ruin your credit. The lawyer in this clip tells CBS that it will only drop your score 150 points, and you'll be able to quickly recover. With 23% of all mortgages now underwater, how soon before the "secret" goes mainstream? The countries of Europe and the global financial system are now tied together like a field of landmines covered with a fine layer of nitroglycerin. All it is going to take is a small match to like the fireworks. 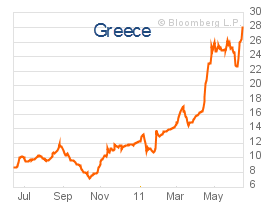 The most likely trigger appears to be Greece as there is currently no bid in the market for its debt. The following chart shows the 2 year bond. (You lend Greece X amount of dollars for two years and at the end of that period you get your original investment back plus a monthly interest payment) The current return on your money for lending to Greece? Why? Because investors now believe you will not get your full principle back at the end of the 2 years, and they are pricing in a "haircut." This means Greece would call you one afternoon to let you know they have defaulted and can no longer make payments on your bond. If you sent them $100,000 of your hard earned money, you may only get back $20,000 to $30,000 in return. The rates on a two year Irish bond (12.28% and 2 year Portugal bond (12.44%) are close behind. If Europe can make it through Greece, these sticks of dynamite lay dormant in the field waiting. Then there are the atomic bombs: Spain (3.52%) and Italy (3.05%). Once rates begin to move higher for these two (and they will) it is lights out. In the meantime, enjoy the last gasp of optimism for both the markets and the economy. I always appreciate walking through downtown Charlotte and seeing the restaurants and bars filled with happy people. Everyone has forgotten the 2008 crisis (when restaurants were empty) and now only see a blue sky ahead. Things are about to get very, very, ugly. I would recommend reviewing your portfolio and taking a very defensive stance as we move toward the next leg down of the current depression. Gerald Celente discusses the "cartoon network's" broadcast of the Presidential reality show last night. America tuned in to learn about the future promises on the way from our bankrupt government and hear about how much better our life will be when we receive these gifts during the next Presidential term. In the real world, as the European banking system is freezing up and stocks are plunging, we continue to take steps closer to the real economic collapse. The one created from a government and Federal Reserve that could not say no to the American people. During a normal boom/bust economic cycle during the 20th century (America's century) American worker's share of national income fell during economic contractions (firings, wage reductions) and grew during economic expansions (hirings, wage increases). This process makes sense. Something changed, however, beginning in 2000. 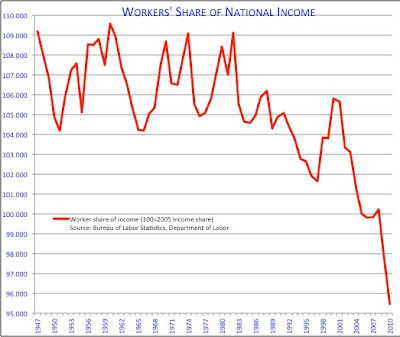 As the chart below shows, after the 2000 economic peak and recession American worker's share of the national income began to fall, but it never recovered. This simple chart shows that the recovery was based on artificial asset price inflation in both housing and stocks, not an increase in the true economic growth of the nation. This process continues today while stock prices rise padding the portfolio of the nation's haves, the working class and poor continue to be left further and further behind. If you are wondering how this story has ended historically, the answer is not well, and many times it is with both anger and violence. The stock market has now quietly fallen 6 weeks in a row. Will the streak continue? The following picture (below) provides another outstanding view of the simple problem facing Greece and why the current solutions will only compound the burden. Based on extensive research by Carmen Reinhart and Kenneth Rogoth in their blockbuster "This Time Is Different" (the best book of 2010) we know that a country historically begins to run into trouble when their debt to GDP ratio hits 90%. GDP (Gross Domestic Product) is the estimated total size of an economy. The size of an economy (think of it as a large business) helps determine the likelihood it will be able to pay back its debts through future tax collections. Just as with any business or individual, there comes a point when your debt sizes becomes unmanageable and your ability to make payments becomes unbearable. This magic point discovered by the authors is at 90% debt to GDP. 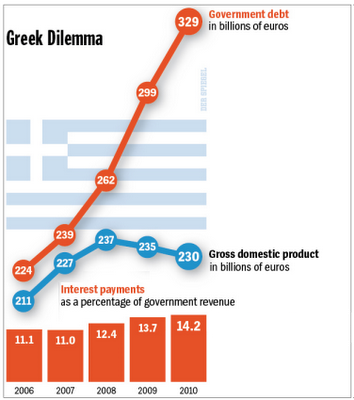 The graph below shows that Greece was already above 100% debt to GDP back in 2006. They had already crossed the magic number and it was only a matter of time before the market's confidence in the debt was removed. You can then see what happened following 2006 as the total debt rocketed higher and the economy size (GDP) turned down. The current bail out structure is set up to add hundreds of billions to the orange line in order to support current debt payments. In exchange for these billions in new debt, the lenders are forcing Greece to cut spending, which will reduce the size of its GDP (blue line) and shrink economic growth further. Do you see how ridiculous this is when it can be viewed on a graph? The only option is for Greece to default on its debt and remove the noose around their neck. Any additional debt (bail out) added will only compound the problem and make the day of reckoning that much more difficult. Why have they refused to allow a Greek default? Because it would trigger a banking crisis the exact same way a Lehamn default did in 2008. What would I do if it was my decision? I would collectively guarantee the checking and savings accounts of every individual around the world. I would stand together and let people know that their cash in the bank will be there for them to withdraw no matter what. 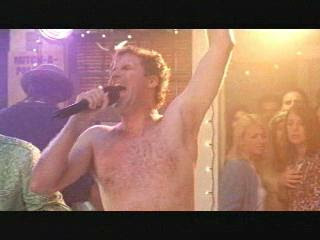 Then I would step away, and let the free market heal the economy. We would enter a global depression lasting 12 to 24 months with prices for every asset collapsing almost across the board. Many people would lose their jobs. Many companies would go out of business. What happens then? New healthy banks would take on deposits and begin lending to both consumers and companies. New companies with healthy balance sheets would emerge and they would begin to hire workers. Individuals would begin saving money as interest rates soared. The banks could use this new influx of capital to lend out to other new healthy businesses. They would hire workers. The strong companies that survived would capture additional market share and grow. They would hire workers. I would sell my gold, purchase a home, buy American stocks, and be proud to live in my country. The money will continue being pumped into zombie bankrupt countries and zombie bankrupt banks in order to ensure record breaking banker bonuses year after year. The banks will then turn around and lace the politician's coffers with millions in campaign contributions. The patient (the global economy) will continue to be pumped with heroine and morphine until it dies and there is nothing left to extract.